For southern Santa Monica Bay region, see South Bay, Los Angeles. For southern San Francisco Bay region, see Santa Clara Valley § San Francisco South Bay. 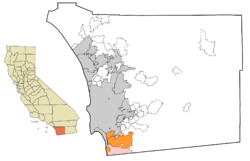 South Bay is a region in southwestern San Diego County, California consisting of the communities and cities of Bonita, Chula Vista, Imperial Beach, Lincoln Acres, National City, and South San Diego. South Bay is a mix of heavy industrial complexes and shipyards, alongside classic Southern California style neighborhoods. One of its cities, Imperial Beach, bills itself as Classic Southern California for being relatively untouched in terms of other coastal cities. The area encompassing the South Bay was originally inhabited by the Kumeyaay peoples. Under Mexican rule, several Mexican land grants were established in the region, including Rancho Janal, Rancho Otay, and Rancho de la Nación. In the 1870s, South Bay Salt Works began operations. National City was incorporated in 1887, Chula Vista in 1911, and Imperial Beach in 1956. South San Diego, including the communities of San Ysidro, Nestor, Palm City, and Otay Mesa, were annexed by the city of San Diego in 1957. The term "South Bay" has referred to the region since at least the early 20th century, with one reference dating from 1918. In October 2007, South Bay was quickly encroached upon by the Harris Fire, part of a series of fires that ravaged California in the 2007 Fire season. Traditionally more residential and calmer than busier North County, 2010 saw that regional cities were taking on projects that included the development of luxury resorts in efforts to revitalize the South Bay. On May 18, 2010 further development of the Chula Vista Bayfront was authorized by the Unified Port of San Diego and City of Chula Vista. [citation needed] Plans included marina expansion, luxury resort development, and the addition of a conference center. Additionally, in Imperial Beach, on September 29, 2010 the Seacoast Inn was demolished to make room for a $20 million resort. South Bay borders both San Diego Bay and the Pacific Ocean. The region is at the southern end of the bay and western slope of the coastal mountains to the east. There are a few creeks that make their way from these mountains with their terminus in either the southern end of the bay, the ocean, or the Tijuana River Delta. 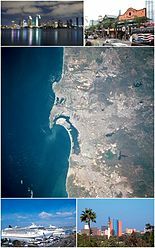 Its boundaries are the San Diego Bay on the west, the United States–Mexico border on the south, National City's border with northern San Diego and Coronado to the north, and the unincorporated communities and Otay Lakes to the east. Nature preserve areas in South Bay include San Diego Bay National Wildlife Refuge, Otay Mountain Wilderness, Tijuana Slough National Wildlife Refuge and Tijuana River National Estuarine Research Reserve. The Tijuana River Estuary is located on the southern coast of South Bay. The river which feeds it has a watershed that drains from both Tijuana Municipality and San Diego County. There have been problems with the cleanliness of the estuary, from the Tijuana part of the watershed, which has led to constructive measures with efforts to clean the water. Located within the Tijuana River National Estuarine Reserve, the Tijuana River estuary is the largest wetland in Southern California. The wetland supports over 370 species of migratory and year-round dwelling waterfowl. The population is 462,843 as of 2005[update], an 18.3% increase from 2000. South Bay is the third largest region of Greater San Diego in population, ahead of East County and below North County. The South Bay is known for its relatively large immigrant population, with many first-generation Mexican-Americans and Filipino-Americans. Twenty-six percent of San Diego County's Hispanic population lives in the South Bay. As of January 2018[update], ancestors of the early explorers of Alta California continue to live in the South Bay. South Bay is served by the Sweetwater Union High School District, National School District, San Ysidro School District, and the South Bay Union School District. There are approximately fourteen high schools, fourteen middle schools, and numerous elementary schools. The South Bay area is also served by charter and private schools. Located in Chula Vista is Southwestern College, a two-year community college and feeder school to University of California, San Diego and San Diego State University. The South County Regional Center contains the South Bay Courthouse of the San Diego Superior Court as well as offices for the San Diego County Sheriff, the San Diego District Attorney, the San Diego County Board of Supervisors, and others. The center is located in downtown Chula Vista. South Bay is served by the San Diego Union-Tribune, whose website features a "South County" section that is largely congruent with South Bay, although the "South County" section includes Coronado. South Bay also receives coverage from the weekly San Diego Reader. Chula Vista, National City, and Bonita are served by the weekly newspaper The Star-News, which was formed in 1954 upon the merger of the Chula Vista Star with the National City News. Imperial Beach is served by the weekly Imperial Beach and South County Eagle & Times. San Ysidro was once served by the weekly San Ysidro Border Press. ^ a b Herrera, Angelica P., Lee, Jerry , Palos, Guadalupe, and Torres-Vigil, Isabel. Cultural Influences in the Patterns of Long-Term Care Use Among Mexican American Family Caregivers, Journal of Applied Gerontology, Vol. 27 No. 2, April 2008 p.146. ^ California Development Board, San Diego County (Calif.). Board of Supervisors, San Diego Chamber of Commerce. Agricultural and soil survey of San Diego County, California. Frye & Smith 1918. p. 34. ^ Zúñiga, Janine (September 29, 2010). "Seacoast Inn demolition underway". San Diego Union-Tribune. ^ a b "River Mouth: South McCoy Trails". Trails.com. Retrieved March 10, 2011. ^ Kada, Naoko, Kiy, Richard, eds. Blurred Borders: Trans-Boundary Impacts & Solutions in the San Diego-Tijuana Border Region. International Community Foundation. March 2004. ^ Cortez, Mario A. (30 January 2018). "South Bay's 'Fronterizo' History now on Display". La Prensa San Diego. Retrieved 12 May 2018. ^ "About this Newspaper: The star-news". Chronicling America. The Library of Congress. Retrieved 5 March 2011. ^ "Eagle & Times". Imperial Beach Chamber of Commerce. May 2009. Retrieved 5 March 2011. ^ "About this Newspaper: San Ysidro border press". Chronicling America. Library of Congress. Retrieved 5 March 2011. Wikivoyage has a travel guide for South Bay.